The migrants are to be "redistributed between Germany, France, Portugal and Luxembourg," Maltese Prime Minister Joseph Muscat announced on Twitter. The group was rescued on 3 April from a barely seaworthy vessel off Libya, and brought to the Italian island of Lampedusa. 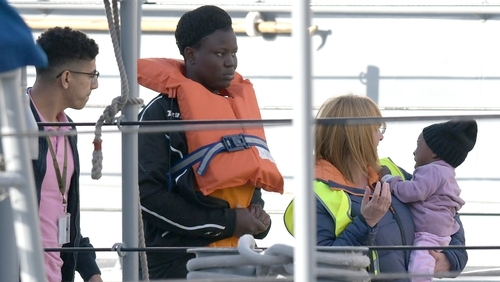 "It's their problem, they must deal with it," Matteo Salvini said, adding he had personally written to the ship's captain to warn him the vessel must not enter Italian territorial waters. Italian interior minister, of the far-right League party, expressed satisfaction at the outcome. "The Maltese are right to denounce the danger of the NGO's - we stand beside them in the fight against human traffickers," added Salvini, who last month insisted Italian ports would be closed to migrant rescue NGOs operating in the Mediterranean to force other EU states to take them in. Although many ships hired by humanitarian organisations have been blocked in ports for judicial or administrative reasons, the Italian group Mediterranea said yesterday that its ship Mare Jonio was ready to set off on a rescue mission. A total of 356 people have died or gone missing in the Mediterranean so far this year, according to the International Organization for Migration.